The end of one story is merely the beginning of another. 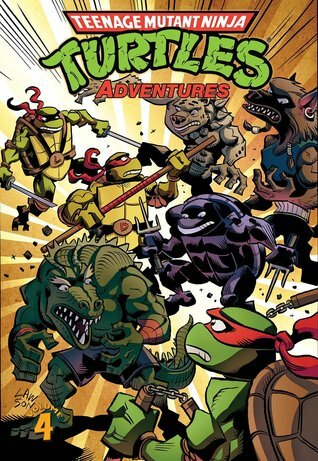 Teenage Mutant Ninja Turtles Adventures, Volume 4, collecting Issues #13-16 of the bygone Archie series, sees the conclusion of the series’ first original story arc, the eponymous Final Conflict saga, and the commencement of the South American tour. New allies and foes are unveiled, moments of peril are coupled with patches of winking levity, and globe-trotting adventures are waylaid by real-world ecological horrors. Frontrunner Dean Clarrain (a.k.a. Steve Murphy) continually used the series as a platform to promote greater environmental awareness and stewardship, though his occasionally anvilicious message is easy to get past.Volume 4’s inaugural story, prophetically titled “The Final Conflict”—the televised sobriquet given to the epic battle by intergalactic wrestling promoters Stump and Sling—is an all-action issue wherein the Turtles, Leatherhead, and assorted comrades battle Maligna’s warrior insectoids in defense of the ancient Turnstone. With inadvertent (or predetermined?) aid from Leatherhead, warlord Cherubae uses the Turnstone to imprison Shredder and his goons. At which point, Cherubae deems the artifact too powerful for anyone to wield and erases the stone from existence. Despite its deus ex machina plot device, the story has the bold trappings of a season finale in how it decisively removes key players from the board: Shredder is incarcerated, Bebop and Rocksteady are exiled to a lush East African-type planet, and Krang is banished to a desolate world brimming with toxic refuse. Dismissing these prominent villains represents not only a major turning point in the series itself, but a marked step in distinguishing this TMNT adaptation from its cartoon progenitor.The second installment, “Leave Heaven Alone,” denotes a return to the mutant-of-the-month issues in which the Turtles befriend an anamorphic jaguar following an unexpected layover in Brazil. Upon narrowly escaping some trigger-happy mercenaries, the Turtles listen as Jagwar laments recent deforestation woes and the union assassination of Chico Mendes. Jagwar ultimately aligns with the heroes to save a kidnapped journalist from the States—April O’Neil. Visually, this issue is an eyesore. Artist Don Simpson, who (thankfully) made few contributions to the series, draws the most bizarre Turtles you’ll ever see. Although quite expressive the Turtles are depicted as scaly, bug-eyed, and malformed, with occasionally elongated arms and slight overbites. As hideous as his Turtles look, Simpson still manages to pen a very attractive April O’Neil (and a brawny, formidable Jagwar). As told from the narrative diary of April O’Neil, “The Howling of Distant Shadows” follows the Turtles and Jagwar in their ongoing journey through the Amazon, and more notably, their encounter with a Jamaican werewolf of sorts, Dreadmon. Plesiosaurs and Coipacu tribesmen abound this curious tale in which the intrepid heroes team up with Dreadmon to liberate enslaved villagers from pirate-miners. Nearby, a Clint Eastwood-esque gunslinger reports the Turtles’ interference to his employer in New York. Readers are offered mere glimpses of the latest villain, a corporate exec named Null, concealed behind an imposing chair a la Doctor Claw. Needless to say, Null will have big shoes to fill in Shredder’s absence. The talented Ken Mitchroney returns with his usual quality that readers like me have come to appreciate; his delightfully whimsical style is unsurpassed by the occasional stand-in artist, and his character designs are consistently clean and recognizable.As the South American tour draws to a close, the Turtles are reunited with Man-Ray in Volume 4’s closing issue, “Dreadging the Ocean Blue.” Bidding farewell to their newfound friends, April and the Turtles happily set sail for home—but not without another overt PSA on pollution. When they’re accosted by a giant high-tech submersible piloted by Kid Terra, Mr. Null’s henchman, the Turtles and April are briefly interned. Man-Ray and his shrimpy sidekick, Bubbla, are also being held captive. As the heroes force their way out of Terra’s underwater facility, Bubbla is killed by a stray bullet from the cowboy’s pistol. The scene transpires rapidly without so much as a heartfelt goodbye. You have to admire the writers' cajones—killing an adorable character in an all-ages comic was a gutsy move. As unexpected as Bubbla’s death was, readers will feel little pathos for the puny second-banana whose life in the series spanned no more than a dozen panels. Nevertheless, Bubbla’s demise signified not only a certain loss of innocence but the ongoing evolution of the series, one in which death plays a pivotal role…and readers must concede the cold truth, that no one is safe.